Hougoumont, the day after the battle (1886) by Eyre Crowe A.R.A. Original caption: ‘Leaving Hougoumont, my attention was called to a group of wounded Frenchmen by the calm, dignified and soldier-like oration addressed by one of them to the rest. The speaker was sitting on the ground with his lance stuck upright beside him – a veteran lancer of the old guard, who had no doubt fought on many a field’. 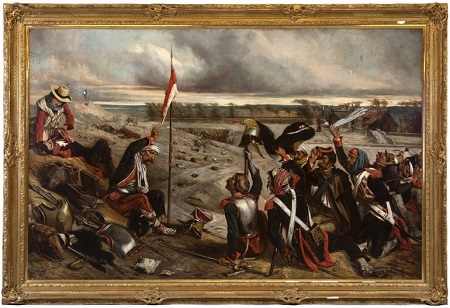 The painting was acquired by Steven J Harrison Antiques, Karlavägen 74, Stockholm, Sweden, in May 2010, and auctioned by Toovey’s of Washington, West Sussex, on 23 March 2011. In Gallery X the visitor will find Mr. Eyre Crowe’s Hougoumont, June 1815, the day after the Battle (976), wounded French soldiers of various corps cheering a sergeant who addresses them with an earnest air. All the faces are marked by spirit and energy, and full of natural dignity. The figures are ably, but not exhaustively drawn. The colour would bear clearing, and the composition needs a little massing. … painted with all the accuracy of detail to be expected of a scholar and man of letters, and well composed, but disagreeably crude and heavy in colour.